The Tokaido Shinkansen (東海道新幹線 Tōkaidō Shinkansen) is the first Shinkansen bullet train line that opened in 1964 between Tokyo and Shin-Osaka Stations. It is the busiest shinkansen line in Japan since it links Japan's five largest cities: Tokyo, Yokohama, Nagoya, Kyoto, and Osaka. operated by the Central Japan Railway Company. The line is seamlessly connected to the Sanyo Shinkansen line which goes further to Hakata Station in Fukuoka Prefecture. Three types of bullet trains run on the line: Nozomi, Hikari, and Kodama. Nozomi stops only at the largest cities, while the Hikari stops at more stations but not all. Kodama trains stop at all shinkansen stations. 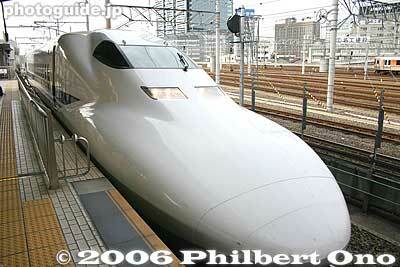 Via Nozomi trains, it take 2.5 hours to travel between Tokyo and Shin-Osaka. The Japan Rail Pass also cannot be used on Nozomi trains. In Shiga Prefecture, the Tokaido Shinkansen stops at Maibara Station, the prefecture's sole shinkansen station. Only the Kodama and a few Hikari shinkansen trains stop at Maibara Station. People visiting southern Shiga can get off at Kyoto Station and take a local train line to enter Shiga. This page was last edited on 2 July 2014, at 21:02.